(2:15 p.m.) -- Passengers on MSC Cruises' first-ever world cruise will be able to choose from a number of overland adventures, ranging from 19 hours to seven days in length, during their 119-day sailing. Overland excursions allow cruisers to spend more time in a specific destination and then re-join the ship after a few days on land. "Our excursions allow guests to dive deeper into the local culture, cuisines and attractions -- especially overland excursions that allow for an extended stay in some of the most exotic locations," said Roberto Fusaro, president of MSC Cruises USA. 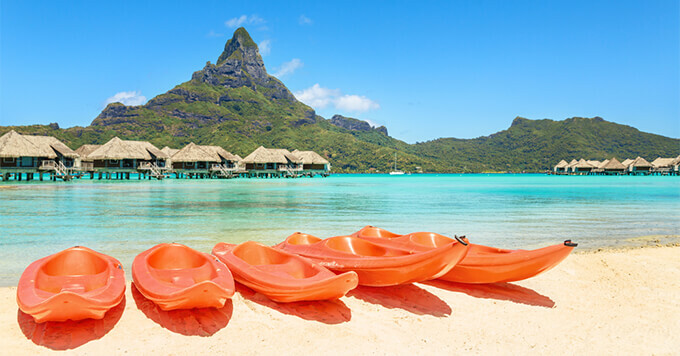 A two-night overwater bungalow stay in Bora Bora that includes accommodation, Tahitian meals, a spa treatment, and a shark- and ray-watching trip with a lagoon tour. A six-night tour to Aqaba via Jordan that departs from Muscat, Oman, and includes stops in the Jordanian cities of Jerash, Amman and Madaba ("City of Mosaics"), as well as Mount Nebo, the River Jordan and, of course, Petra and the deserts of Wadi Rum. Hotel stays and a night camping beneath the stars are included. A 19-hour Werribee Slumber Safari, which includes an overnight visit to the Werribee Open Range Zoo in Australia with a luxury camping experience. A two-night visit to Delhi and Agra with a stop at the Taj Mahal. On this tour, which departs from Colombo, Sri Lanka, world cruisers will travel north with a stay in a luxury hotel and meals included. The world cruise embarks January 5, 2019, onboard MSC Magnifica, visiting 32 countries. Cruisers doing the full sailing receive 15 standard pre-selected shore excursions, which are included in the cruise fare; overland excursions cost extra. Space is limited on the overland tours, so world cruisers should book soon. The line's second world cruise will depart on January 5, 2020.